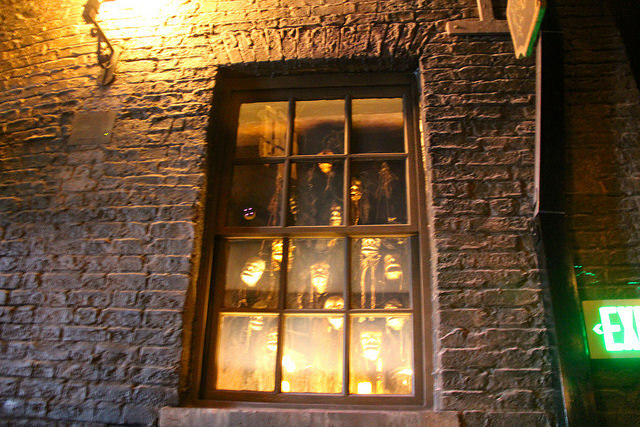 Noggin and Bonce was a shop in Knockturn Alley, specializing in shrunken heads. It had one window facing the street that displayed shrunken heads floating in a liquid. With this Mimblewimble spell, you cause the shrunken heads to be silent! Also known at the Tongue Tying Spell, Mimblewimble makes the victim’s tongue stick to the roof of their mouth for a short while, making it impossible to speak. 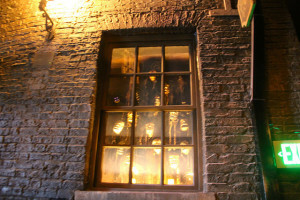 You can find the spell casting location, just to the left of the Dystyl Phaelanges window in Knockturn Alley. You can’t miss the shrunken heads inside a shop window. If you ever have trouble finding interactive spell locations in Knockturn Alley, be sure to check out your map. Although it’s dark in Knockturn Alley, your interactive wand map will glow, showing you all the spell locations! For more information about The Wizarding World of Harry Potter and all the goings-on in Diagon Alley, be sure to subscribe to our newsletter. Book your Harry Potter and Universal Orlando package or theme park tickets today! Want to get all our tips and tricks for visiting the Wizarding World of Harry Potter? We wrote a travel guide for the Wizarding World of Harry Potter Hogsmeade! We included all our tips and tricks that we’ve learned over the last year to make your visit to the Wizarding World as magical as possible. Be sure to check it out! Get your Harry Potter theme park souvenirs from the official Harry Potter shop, the WB Shop! Butterbeer Recipes You Can Make at Home!